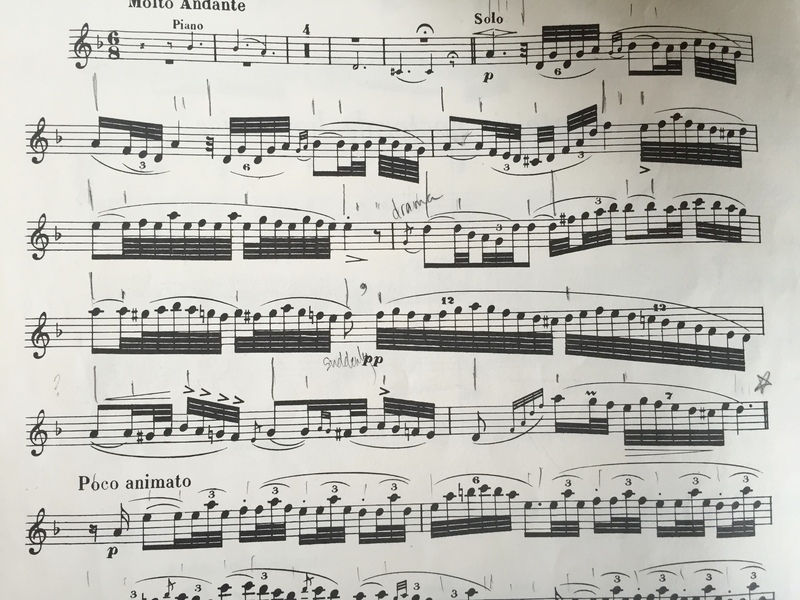 This is the fourth article in a series about “marking music,” providing visual solutions to problems musicians encounter during practice. Our brains cannot remember everything. By carefully and consistently making marks in the music, musicians will learn music faster and with less frustration. This blog post will focus on how using pencil marks can aid in the learning of difficult rhythms. Rhythms are the analytical, mathematical side of music making. There is little grey area in interpreting rhythms. They are either right or wrong and learning them correctly from the beginning is critical. My favorite way to mark rhythms involves drawing lines to represent the beats in a measure. I draw a short vertical line directly over the note that is to be played on the beat. The lines occur in the same place that my foot comes in contact with the floor when tapping the tempo. In the above example, a have drawn vertical lines to represent where the beat falls in each measure. 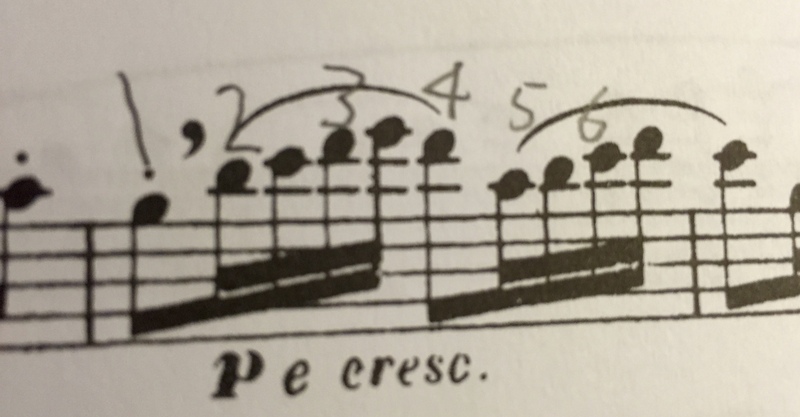 Notice that in the syncopations, the vertical line is drawn between the notes. When playing syncopated rhythms, it is important to feel the beat (or the foot hitting the floor) in the space between the notes. In this example, notes are played on beats 1 and 3 but not on beat 2. This measure is made much more readable by adding in vertical marks over the large beats (dotted quarters). Visually, the organizes the measure into three distinct parts. By tapping my toe, I have kinesthetic feedback to tell me if my notes are starting on the right beat. In this example, I wrote in the numbers 1-6 for each of the eighth notes within the measure. This makes it easy to see how the notes relate. We could re-write this measure in 6/4 time with quarter notes and eighth notes to achieve the same rhythm and the same counting. For the final example, I offer this example from the opening passage of Doppler’s “Hungarian Pastoral Fantasy.” I have added vertical lines to represent where each of the six eighth note beats occur in the measure. You will notice that there are longer lines over the two larger beats – the dotted quarter notes. I am a visual and kinesthetic learner so marking my music with vertical lines to represent beats is essential. It graphically organizes the music into discreet packages that I can see and feel easily. Of course, this is not a new idea, nor is it one I created. In fact, I see these kinds of marks all the time in orchestra music used by professionals. I have developed a system that works for me. Now, go find one that works for you and use it consistently!